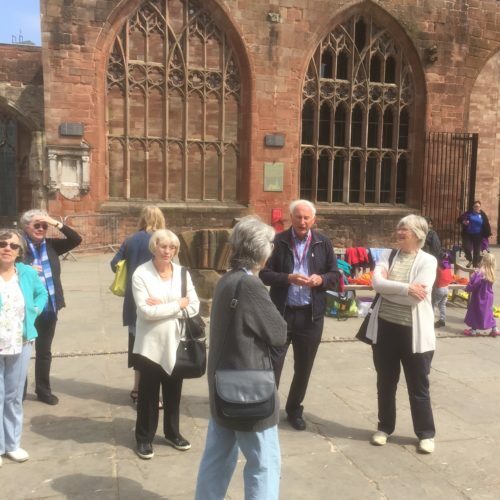 On May 23rd a group from all three parishes made a visit to Coventry to have a guided visit to the famous Cathedral. We were greeted by the Canon Precentor, David Stone, and spent 90 minutes on a guided tour of both the old (ruined) Cathedral and the new building, designed by Sir Basil Spence. We especially were impressed by the stunning stained glass and the Graham Sutherland tapestry. We were able to participate in the “Litany of Reconciliation” which is prayed daily in the Cathedral and at other war damaged sites round the world. We were able to look at the old surroundings and the Herbert Museum, and were impressed by the campus of the University.